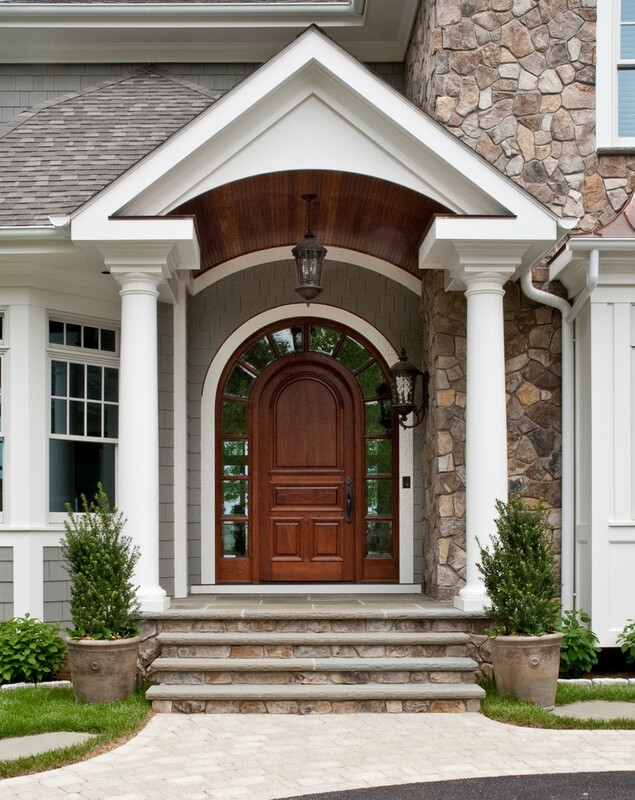 What do you think about the colonial front door? Most people link it to colonial style architecture which is identical with some specific architectural characteristics. Let’s imagine that most colonial style architecture emphasizes the rectangular facade, pointed roof, and step. Colonial front door usually has a pair of windows on its both sides: left and right. Yet, not all units are designed in such specific characteristics. Few of them have more variants in details. They also play the colors to make them much more attractive and modern. To see huge variants of colonial front door ideas, let’s see the review of each unit below. A colonial front door with modern flavor. The design is simply clean and minimalist, accented by small glass windows along the door. Dark wood color finishing really fits the side windows’ trims. 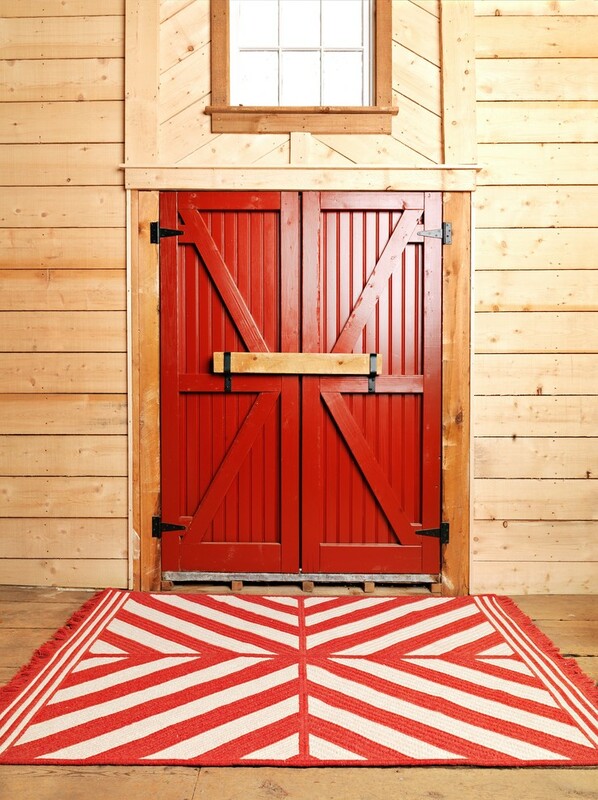 A farmhouse colonial front door idea. This entrance door is originally made by professional. With purely wood material, it’s possibly built as a masterpiece craftsmanship for a farmhouse. White finishing looks so matched with the exterior. 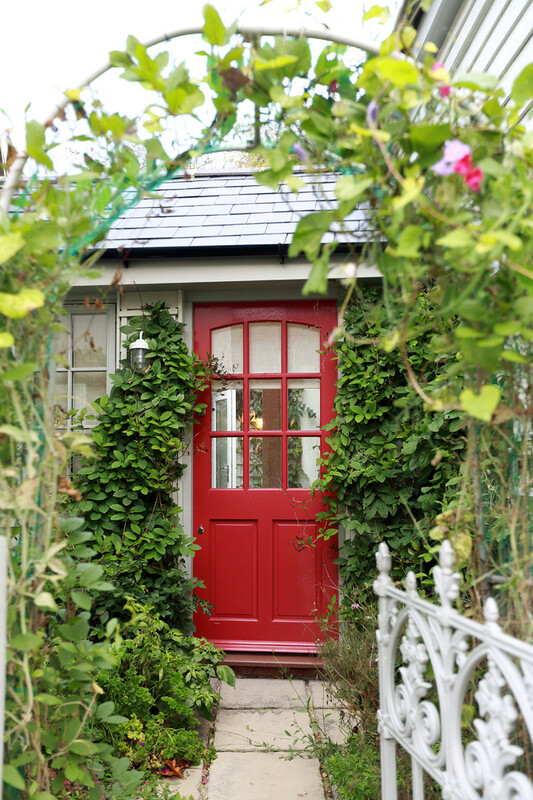 Stunning colonial front door in red. Stripes and textured door panel keeps this entrance door stylish. Barn concept makes it obviously stands out. 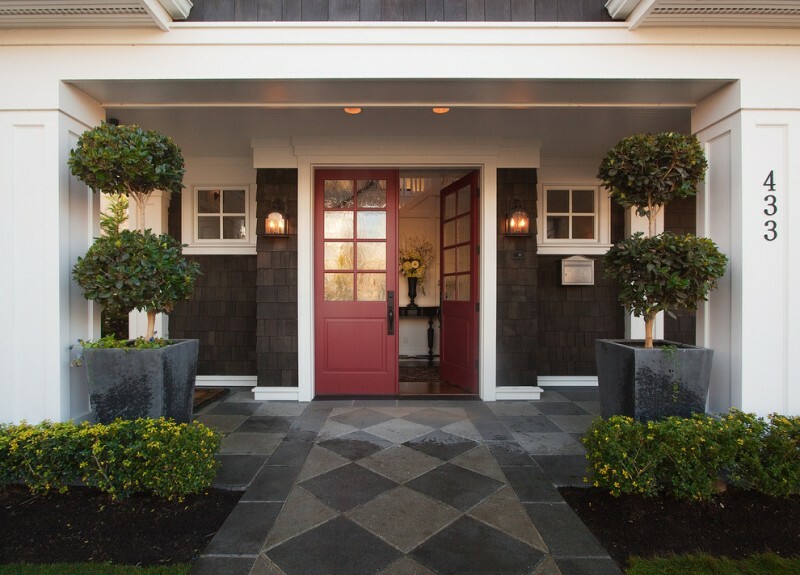 A modern colonial entry door idea. Wood finishing covers the door panel and windows’ trims. Its natural look adds warmth over this mute & cold grey exterior. Two opposite atmospheres are discovered here. 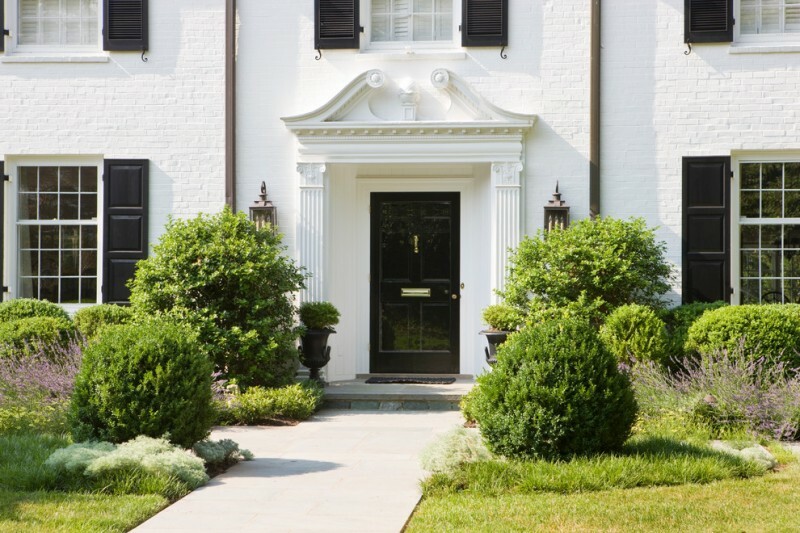 A simple entryway idea with black-finishing colonial front door, large green bushes, and a pair of colonial style sconces. 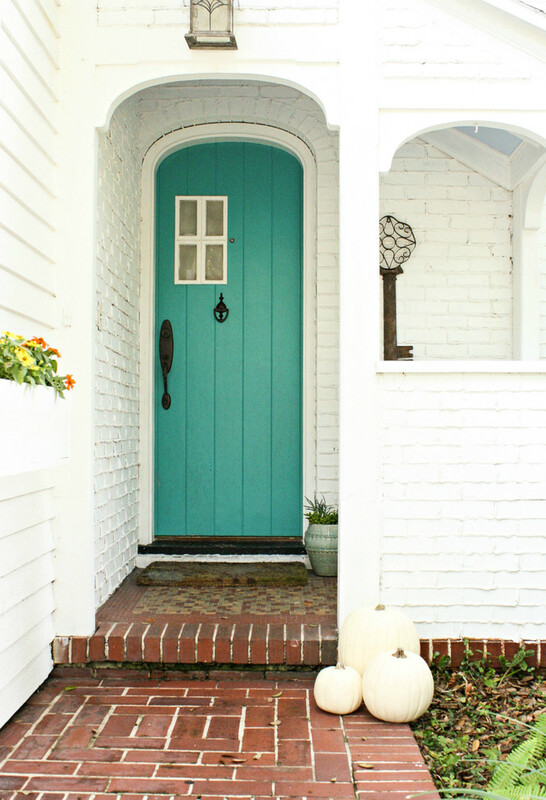 The door’s color beautifully contrasts with exterior which is entirely painted in white. 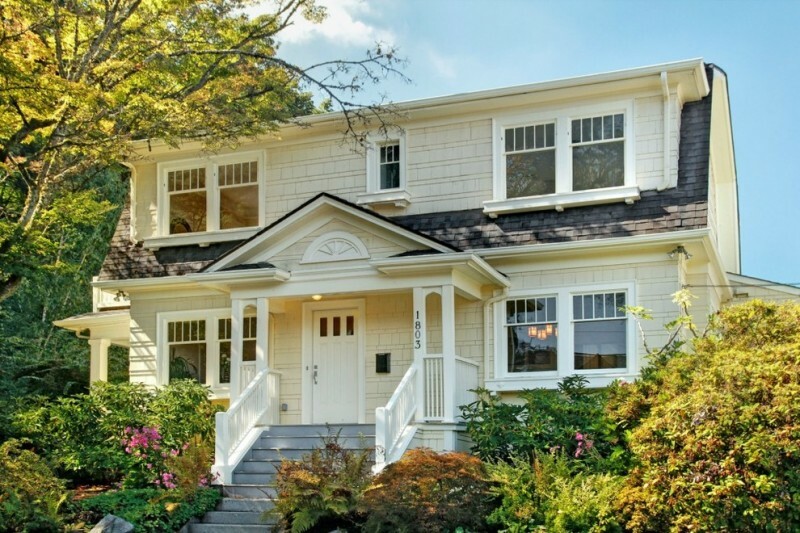 This is an inspiring Dutch colonial exterior idea. Scarlet and black solid create a classic exterior. 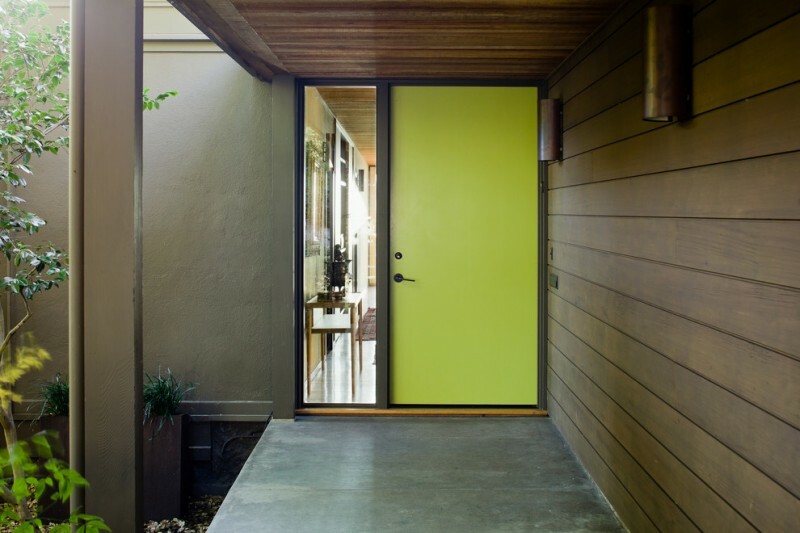 The color combination gives warmth and inviting signal for guests or neighbors to come in. This is a great idea to adopt if you like black exterior. To reduce a little dominance of black, consider other colors and planters for more beautiful look. Solid colonial front door idea with side windows accented by wrought iron-carvings panel. 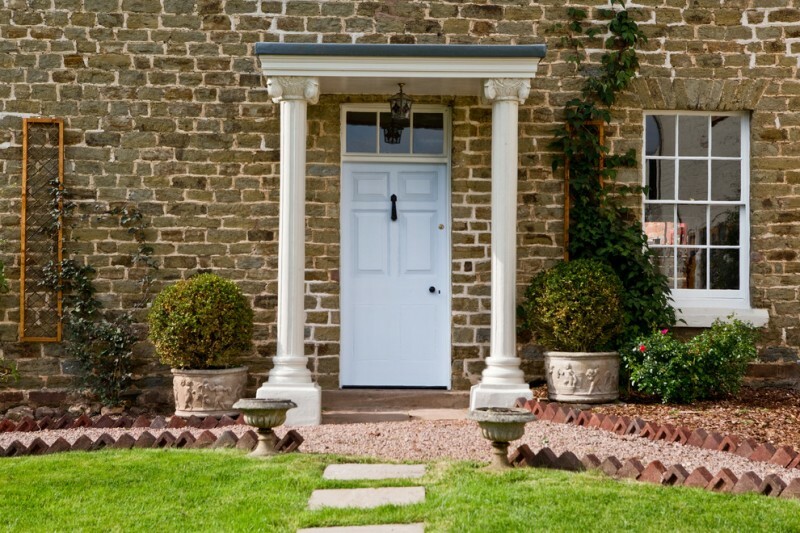 Feel the timeless look by adopting this front door idea. Add an exterior pendant lamp that looks similar to the windows’ metal panels. 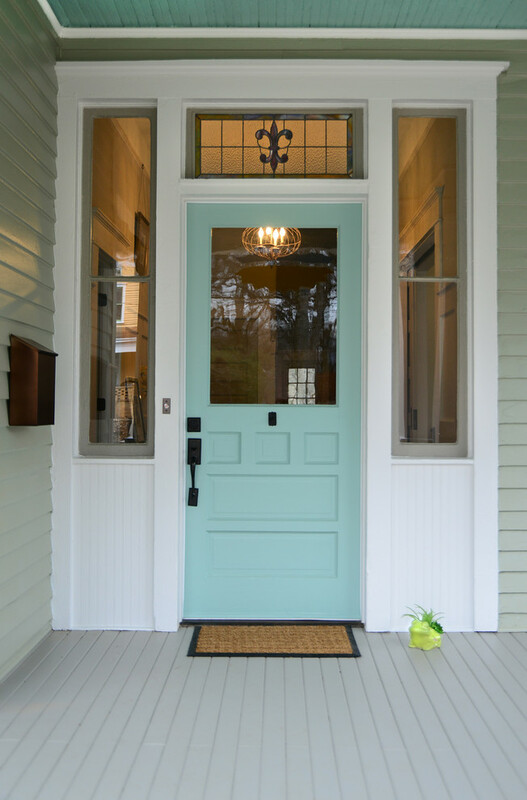 Stylish craftsman colonial front door with side mirrored-windows and transom. The door is built from dark wood highlighted by reflective side window panels and transom. Cultured stone exterior walls are installed for lower part of exterior, while the upper one is paneled by vertical wood siding painted on refreshing green. This is another idea of colonial front door with transom and side windows. The difference is in color and door’s design. A pair of planters is put near the side windows for a natural and beautiful accents. 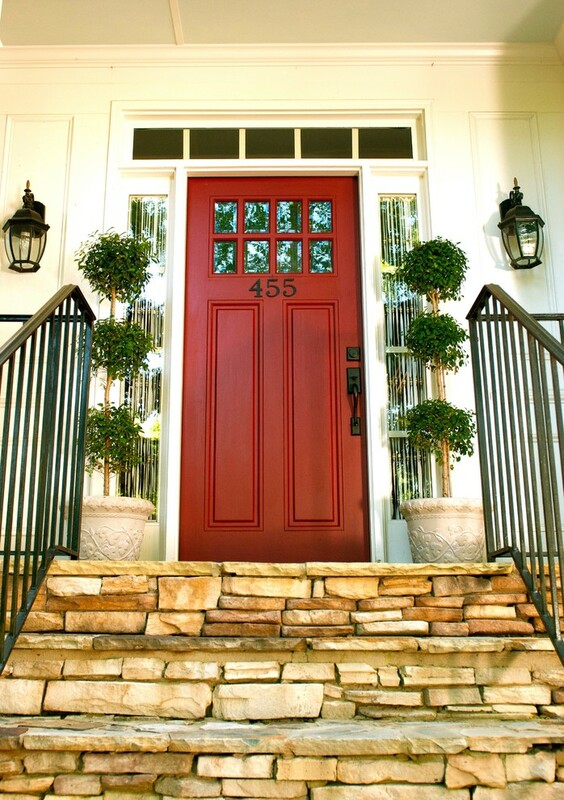 Pop red finishing and door numbers also add an inviting look. 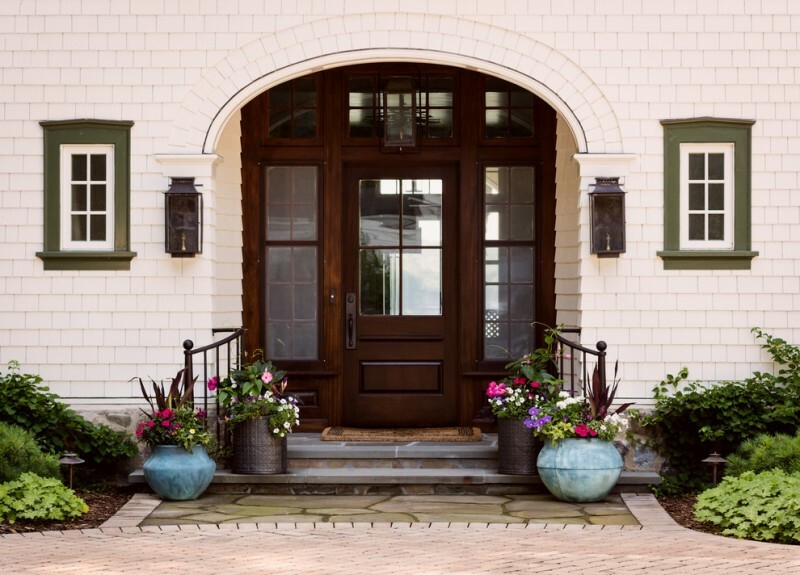 If you love craftsman and colonial style, you could adopt this idea of colonial front door for your exterior. 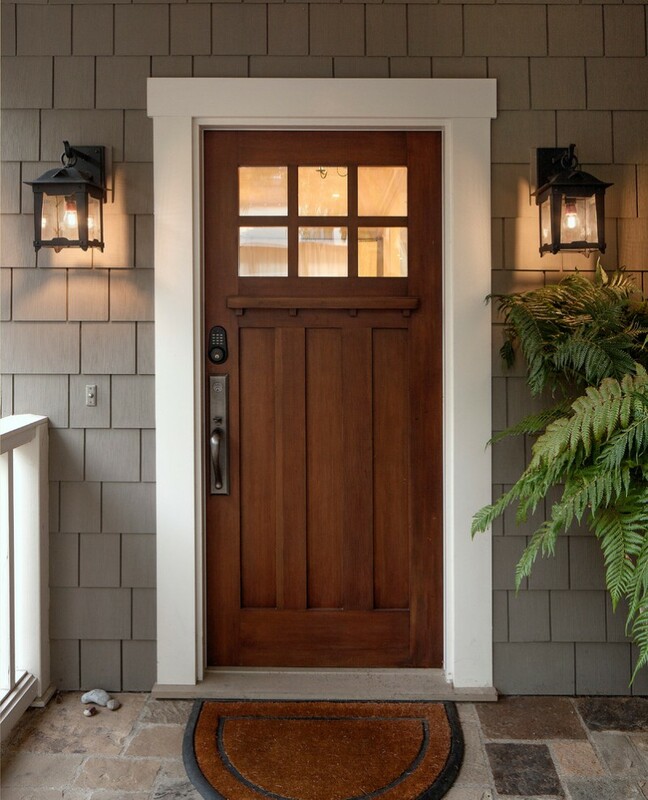 The idea exposes the natural wood specimen for a colonial but stylish front door and a couple of lite for each side. Add the reflective glass panels on each sidelight for a modern touch. 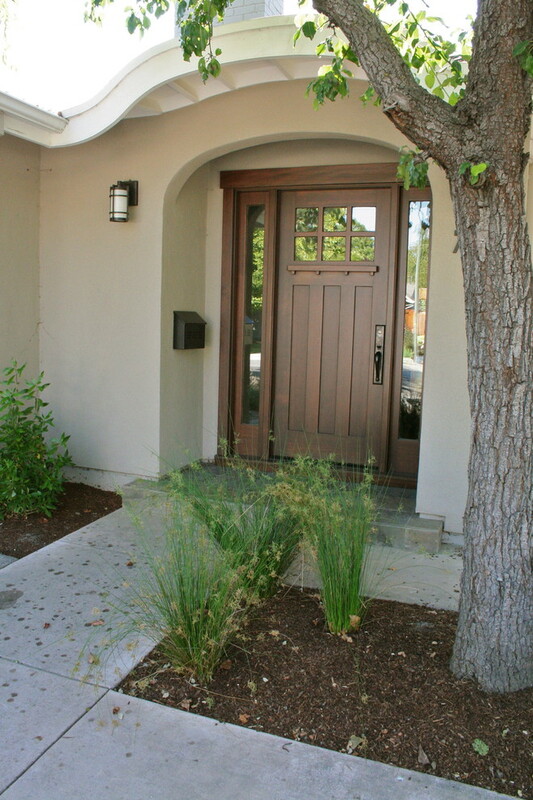 Simple but large craftsman front door in wood color. The color reflects your down-to-earth personal style. It also makes not-serious sense. The door gives you extra security and natural beauty as well. 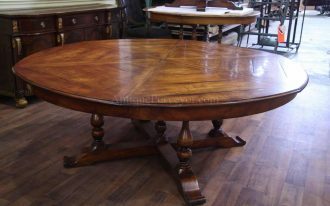 Such choice is a perfect choice for you guys who love old and natural in material. 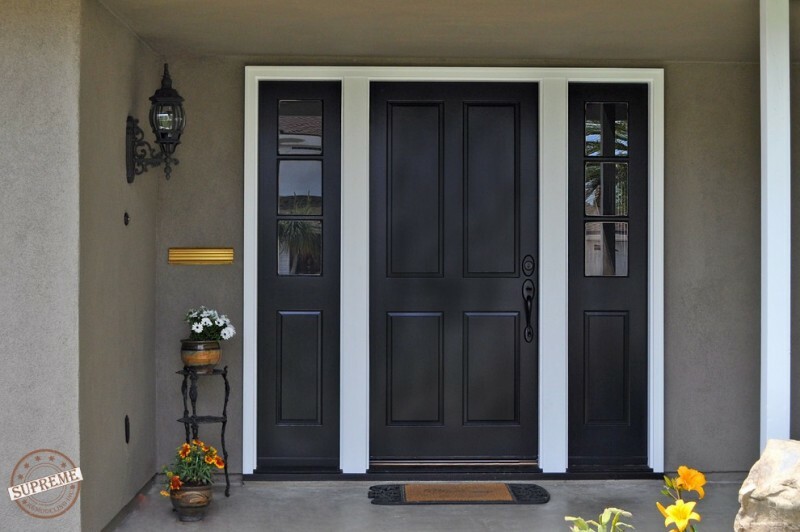 An example of classic front door idea in black framed by white trims and sidelights on both sides. The design really fits red bricks exterior walls and super amazing entry gate. Black front door with a couple of curved-shaped glass panels at center. The design is unique and classic. It quite matches with the windows’ trims and their decorative windows’ railings, giving the beautiful highlights in shapely details. If you dislike something conservative for your front door, you may adopt this idea for more stylish. It’s good for any home exterior facades and can effectively improve the aesthetic appeal. 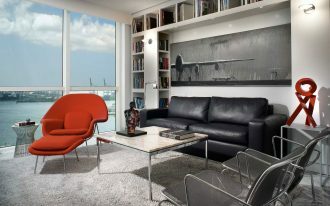 This design offers modern and minimalist look. Black and its matching glass window panels display higher option of ornaments. This group of glass windows can be best alternative of sidelights usually inserted on most Colonial style front doors. 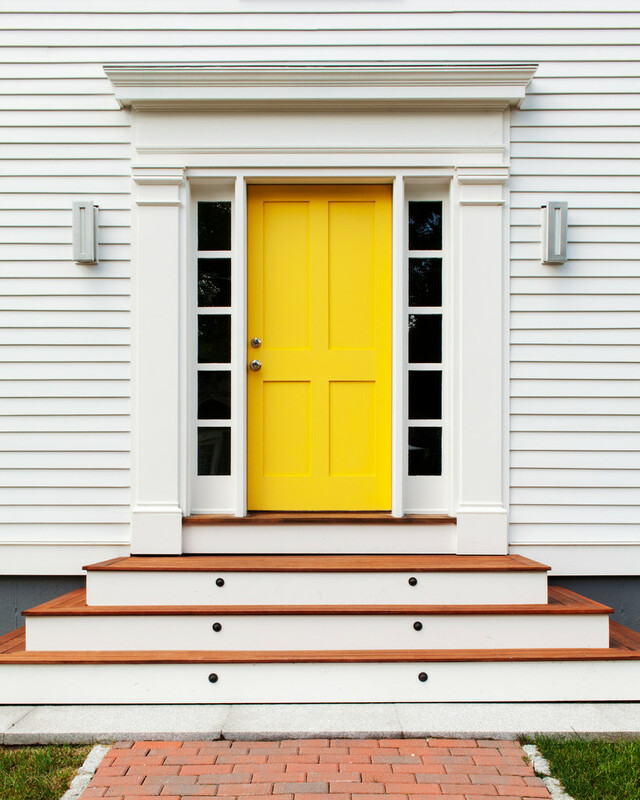 Highlight your colonial front door with your favorite color. 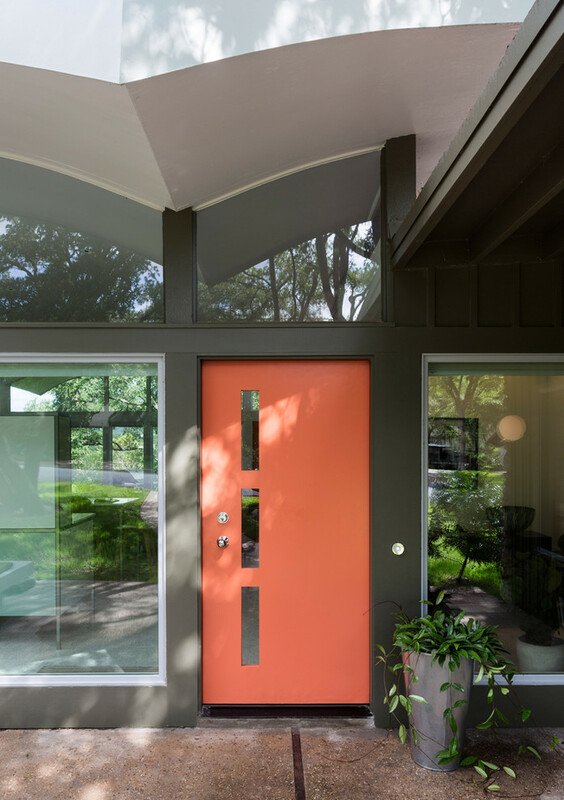 In this modern age, most people love pop of colors for their home design, including the exterior. 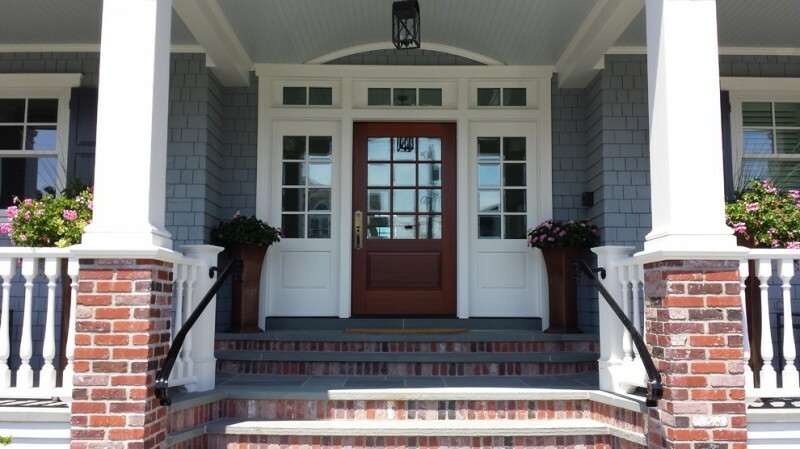 Like in this picture, you’ve found a colonial style front door has bright blue sea color as the basic tone, and all complementary items like knocker, handler, and even central-upper glass window panels are finished in black for a contrasting look. It’s gonna be so stunning spot if you collaborate it with shabby red bricks exterior walls. An elegant exterior idea for a countryside house. The front door is complemented with luxurious Victorian style entry gate (which is accented by blue architectural line on top). It also has a frameless transom with glass panels for sunlight access. Attractively, overall layout really blends into shabby & old exterior concept. Modern colonial front door – clean and simple design becomes the main concept, and narrow window with grey glass panel is the accent. 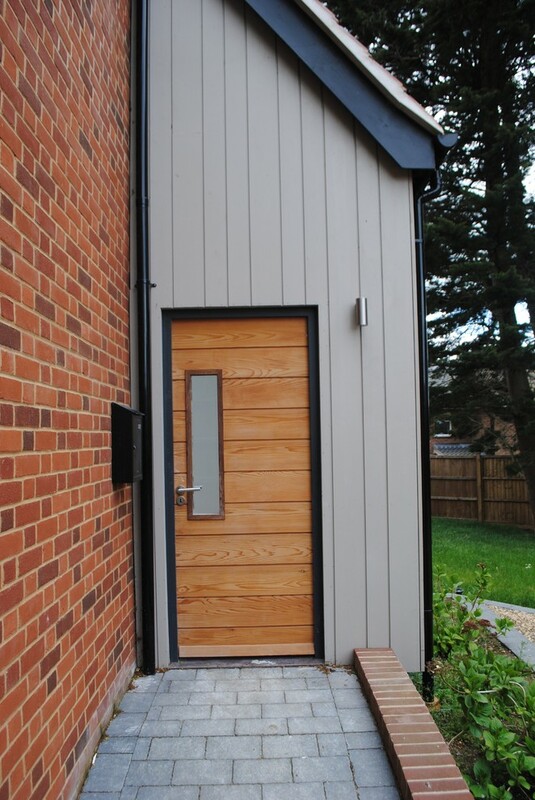 Based on design, it obviously fits modern country style exterior, and it isn’t wrong if you want to apply it on such mix siding and red brick exterior walls. Rustic-colonial combining. It’s unique and artistic. Both concepts are applied perfectly in this door panel. 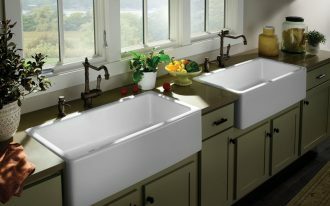 The overall design is adopted from colonial style, while the finishing and complementary layout are truly rustic. The designer probably tends to expose more the natural material as well as the original colonial concept in one frame. Custom colonial front door with transom and black wrought iron handler. Cananga yellow finishing (Cananga yellow is the particular color of yellow inspired from the original color of Indonesian’s Cananga Flower) looks so contrasting with pure white recessed chamber of entryway. Low-light exterior sconce adds a dramatic and romantic illumination around this area. 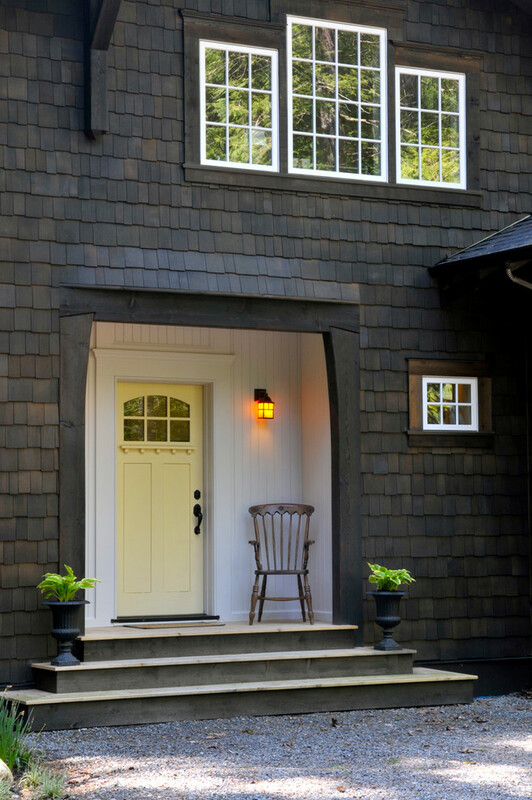 Black wood shingles seems good choice for more stylish exterior walls that beautifully contrast with the recessed chamber and front door. Ultra pure white exterior accented by blue spa colonial front door. Both color tones are really contrasting yet beautiful to combine. The door panel stuns the exterior and vice versa. This means, they complement each other. Feature the colors with other bold-toned colors like terracotta color and black wrought metal. It must be the prettiest exterior you ever had. 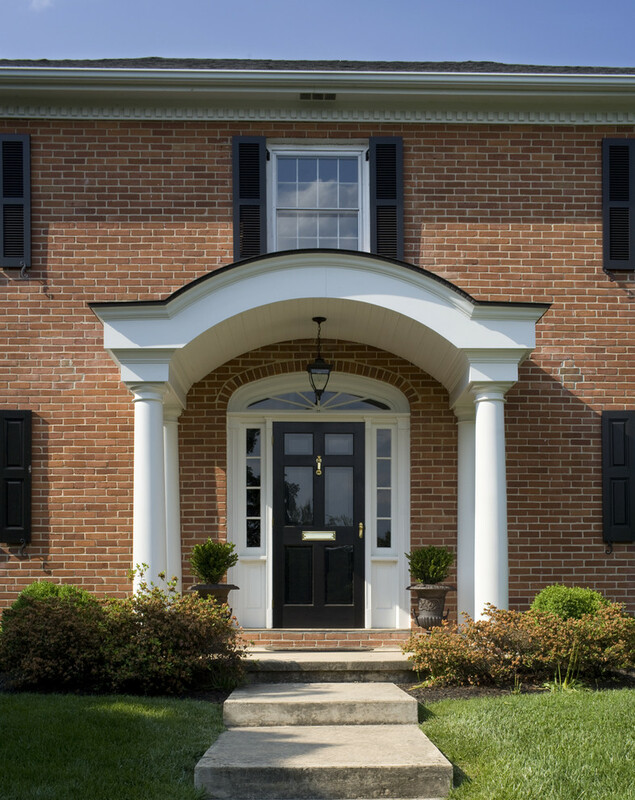 Have you ever tried asymmetric window accent for your colonial front door? It sounds so interesting to do that. 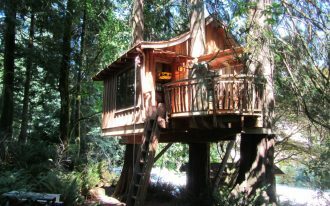 It’s gonna be unique and anti-mainstream idea for most colonial-concept homes. 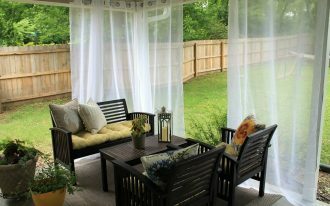 To make you more satisfying, feature it with fun and pop of colors like yellow for a trendy and timeless exterior. Contrast your door with stunning yet light-colored exterior like white. Narrower for bottom and wider for top, a unique design of red colonial front door with curved top. 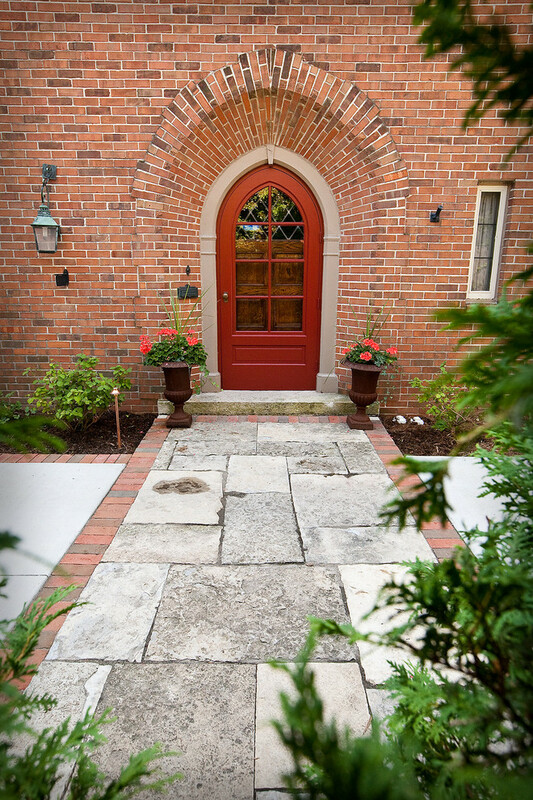 The overall edges of door are filled with red brick arrangements which are installed in curve form, following the door’s shape. And, along the door height, we have transparent glass panel for viewing the outside area. Light blue finishing perfectly matches with white applied on door trims, and plants growing around the brick walls add an exotic look to this entryway. With bright blue, this exterior looks so stunning. The clear glass window panel inserted on door allows the light passes through the room. The glass window also lets us know the glance of outside and inside the house. What a fabulous front door! It uses egg yolk color for basic tone and black glass sidelights on both sides. The color powerfully stands out, giving an obvious contrast to pure white exterior. 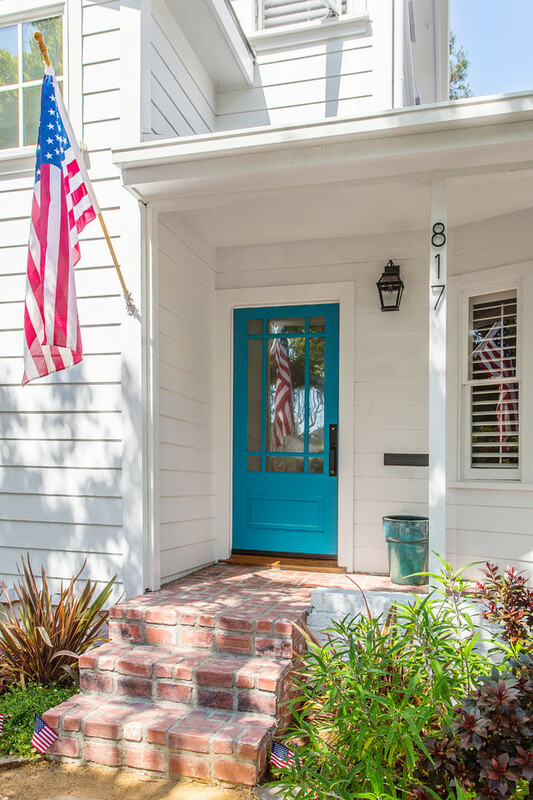 Feel fresh with blue sea covered on your exterior, particularly your front door and windows. 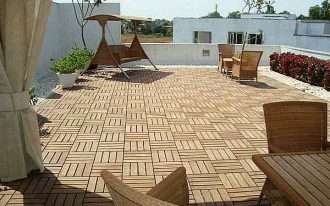 Make them contrary by choosing original Mediterranean concept like terracotta flooring idea, higher curved-top entry gate, and clay-burnt roofs. 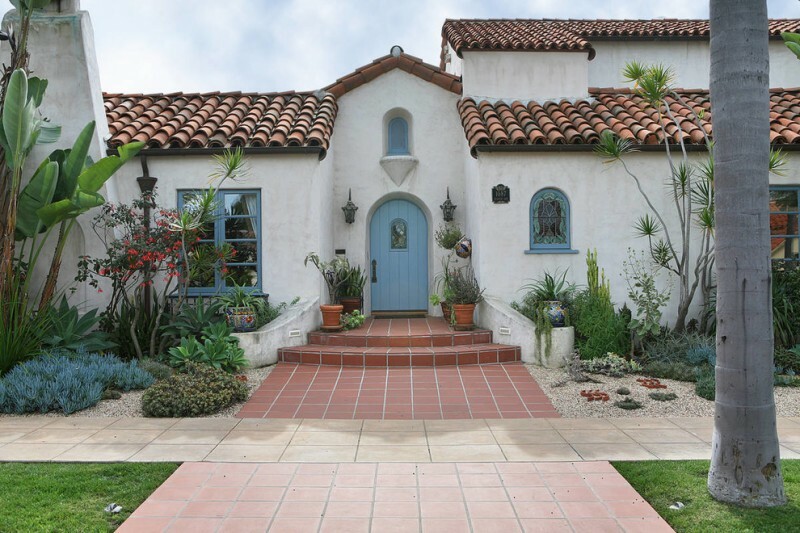 This is a real Mediterranean exterior with gold and dark brown color accents. Both front door and entry gate has different details of design, but they’re similar in trim’s color. 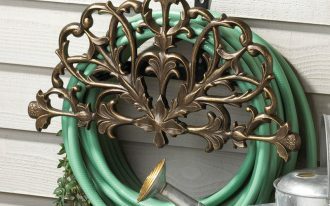 Several small wrought iron ornaments beautify the door and give a pretty look to the door. 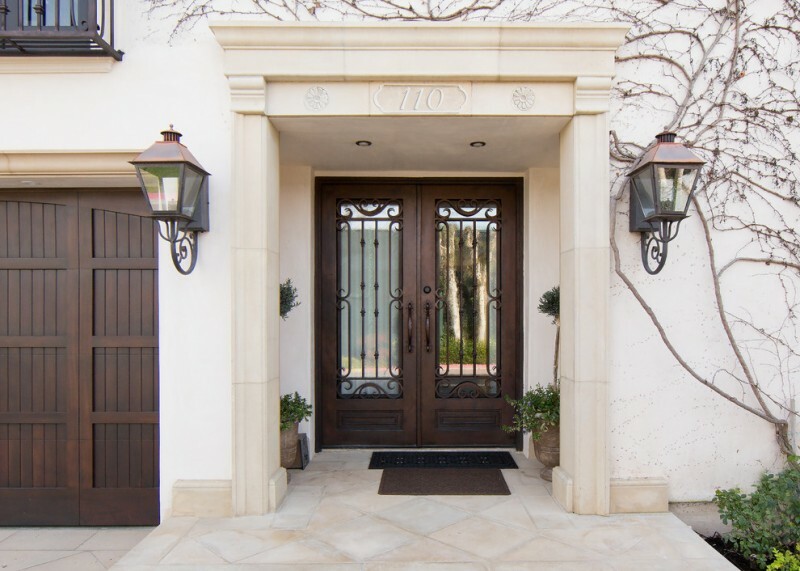 Mediterranean motifs installed near the door also offer special aesthetic value. 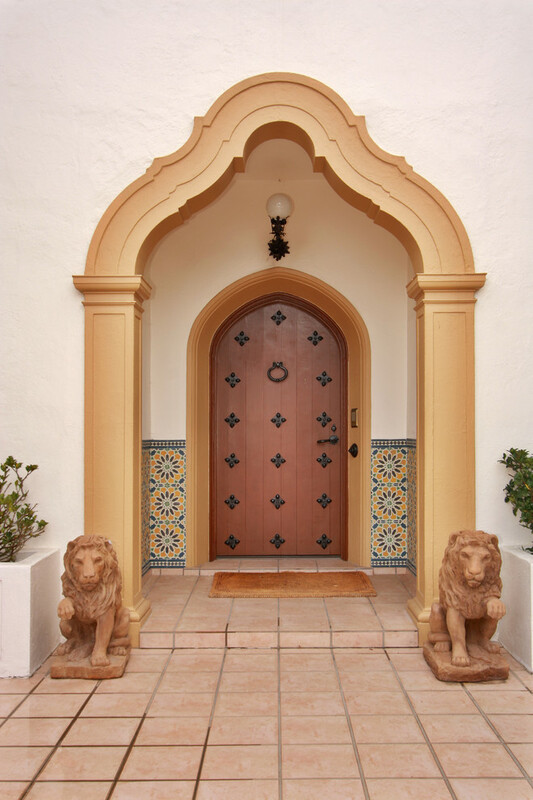 A pair of lion statues here isn’t only the ornaments, but also another specific element of Mediterranean style. Look how these three column wood door panels blend perfectly into this halfway bricks-stucco exterior wall. 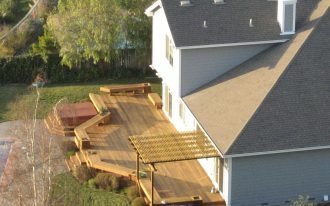 The homeowner chooses dark brown finishing rather than others for more natural and earthy look. 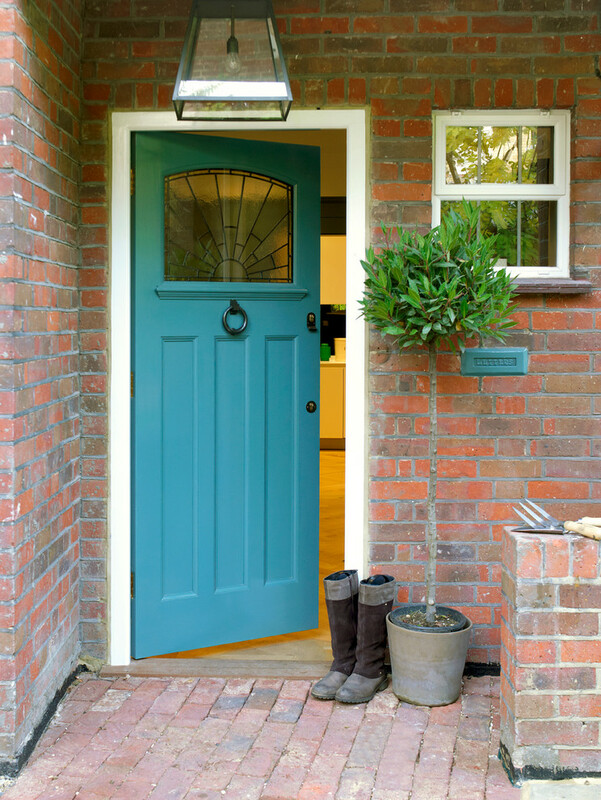 A salvaged front door repainted on classy blue. Blue and white complement each other and they’re closely related to something breezy and fresh like in the beach. 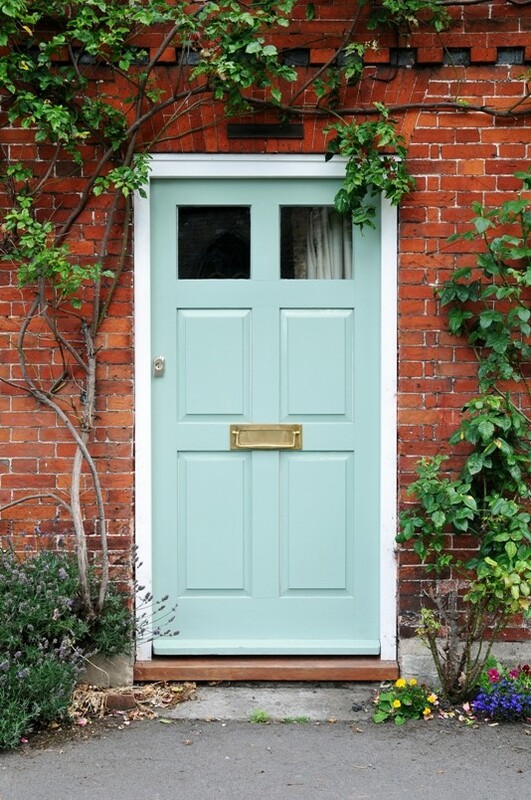 Feel these values just by repainting your old colonial front door with such color, and feature it with ultra pure white. Give grey lines on sidelights’ trims and see their beautiful contrast. The easiest way to have such front door is to install trellises on both sides and garnish it with your favorite green ‘climbers’. Red is one of best color option that can pop up the look. 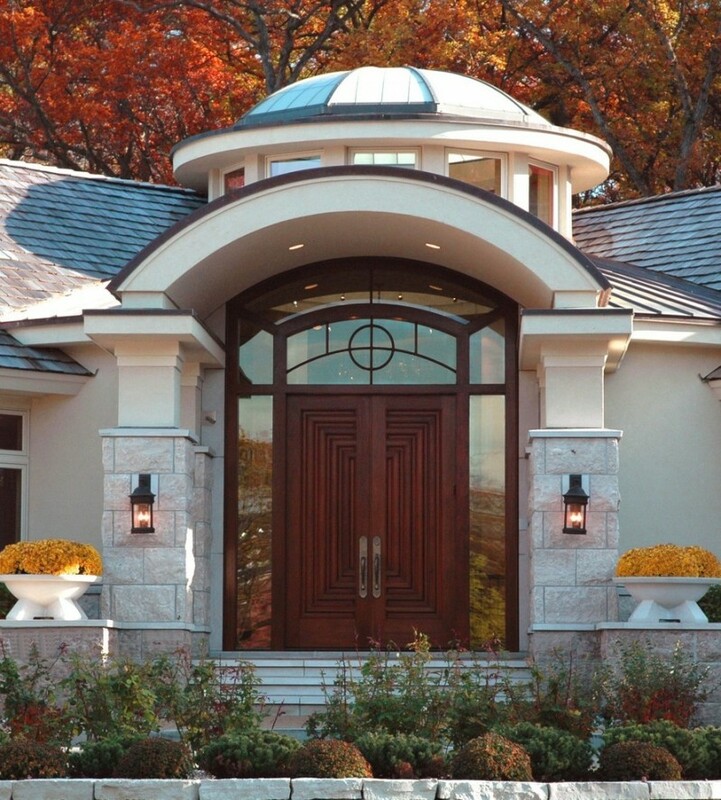 Elegant black front door with windows on both sides. 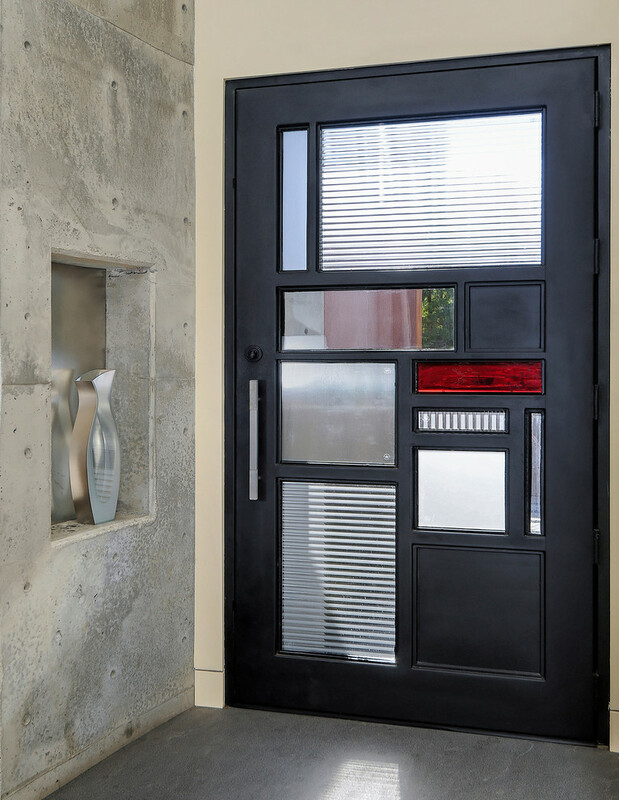 Either door or windows are finished in black with integrated white trims, a stunning look over concrete exterior walls. This idea is possible to apply for traditional exteriors. Add small corner table for planter as the garnish. This front door idea is really unique. Circle glass window accent has successfully attracted us all. It remains us the house of Hobbits. Actually this design puts modern twist for more trendy and stylish look, following what’s happening nowadays. 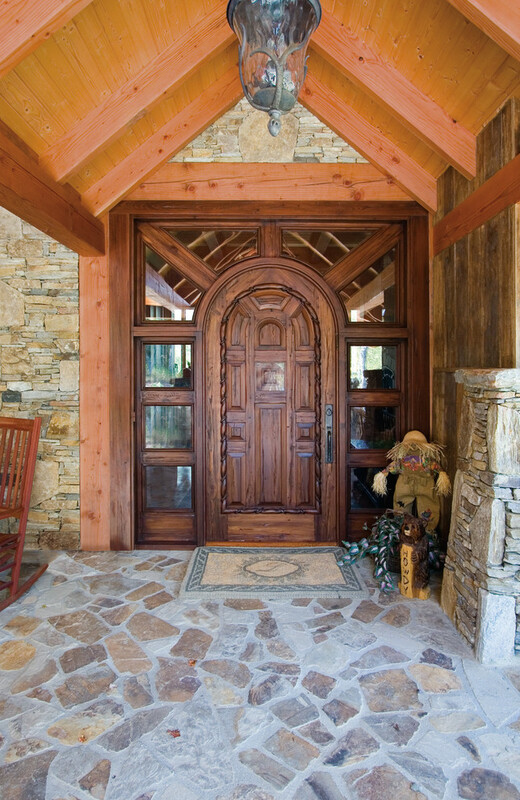 A mountain style entrance with hardwood colonial front door. Look at the door panel’ there are a pair of sidelights that complements the door performance. 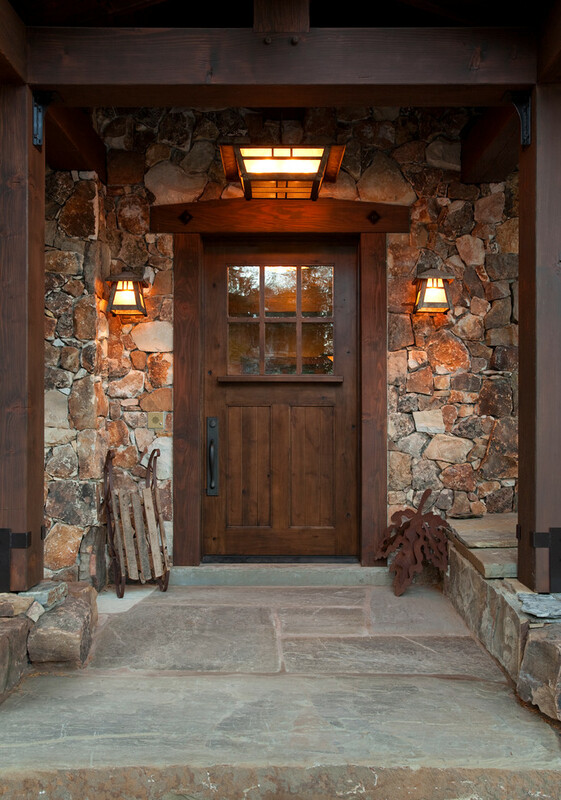 On the entry gate, you’ll find stone walls that fit rustic-look door panel. 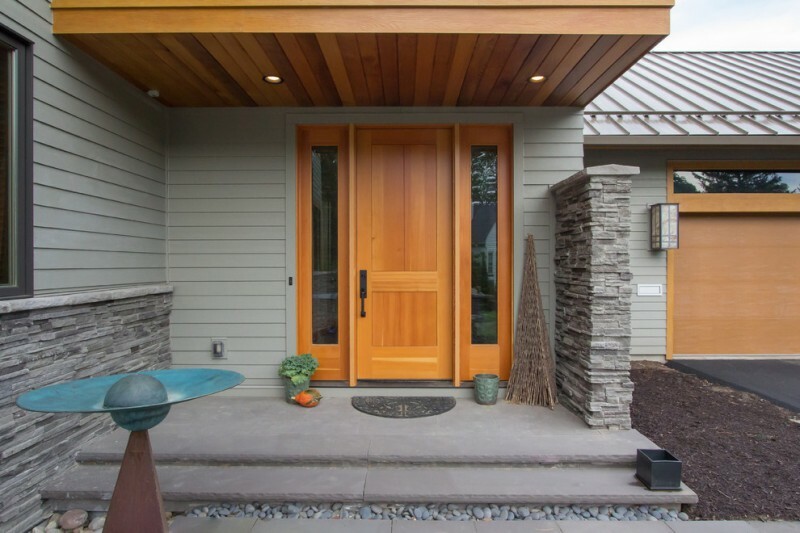 Contemporary-rustic front door idea with sidelights without frames. It seems like a large-column door accented by wood front door and windows in either side. Here, the exterior is finishing in light & earthy brown, obviously contrasts with the door panel and light tone. Mahogany colonial front door with semi-curved top and reflective sidelights. 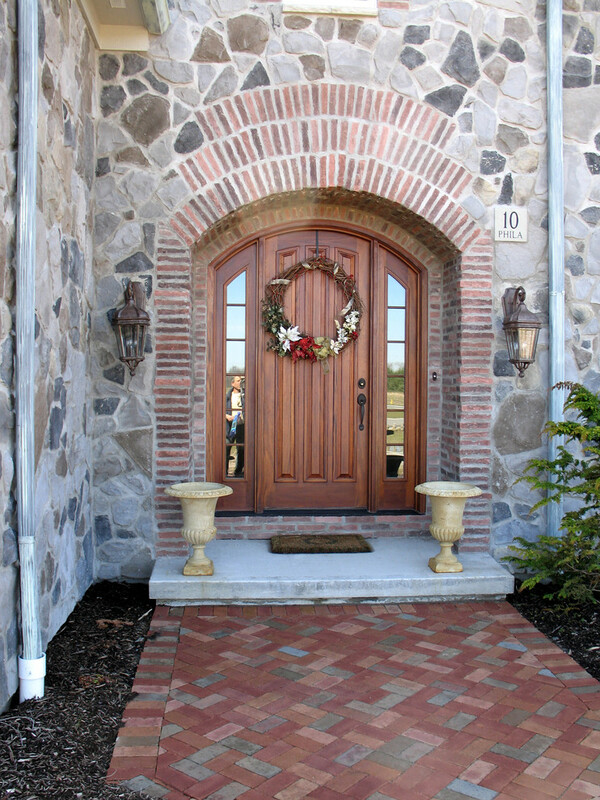 Take a look at the door’s top; bricks are beautifully arranged along the door’s edges, adding the aesthetic value and giving different texture & material against the stone walls. Mix rustic-clean line exterior idea for country homes. Hardwood door panel emphasizes raw texture and look, as what you’ve seen in this picture. The couple of wall sconces also empower the rustic style, yet these small mirrored accents give modern flavor. Classic front door made of dark-finishing wood. The dark color really contrasts with light grey wood shingles walls, a perfect color combination for the overall exterior. 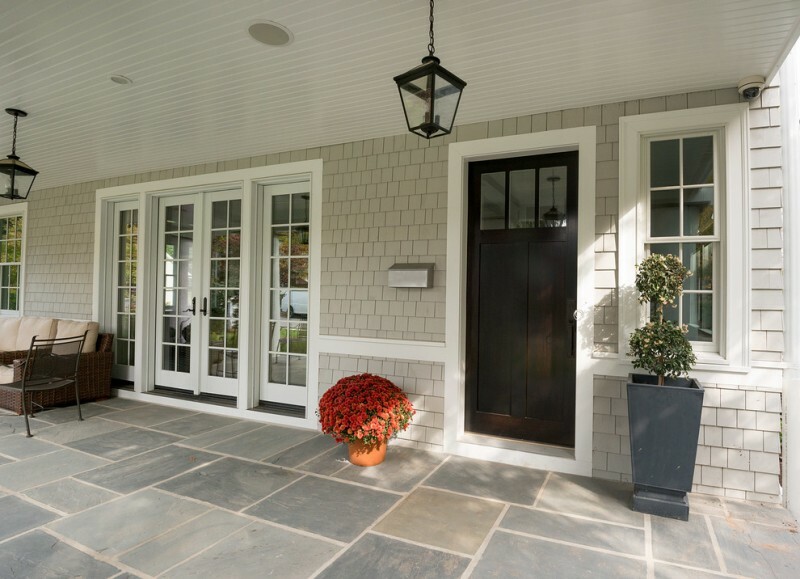 Modern minimalist colonial front door with side-by-side clear glass accents. The design is cool. The door panel is built from hardwood which has been designed in simply clean look, as charming as the frameless glass windows. 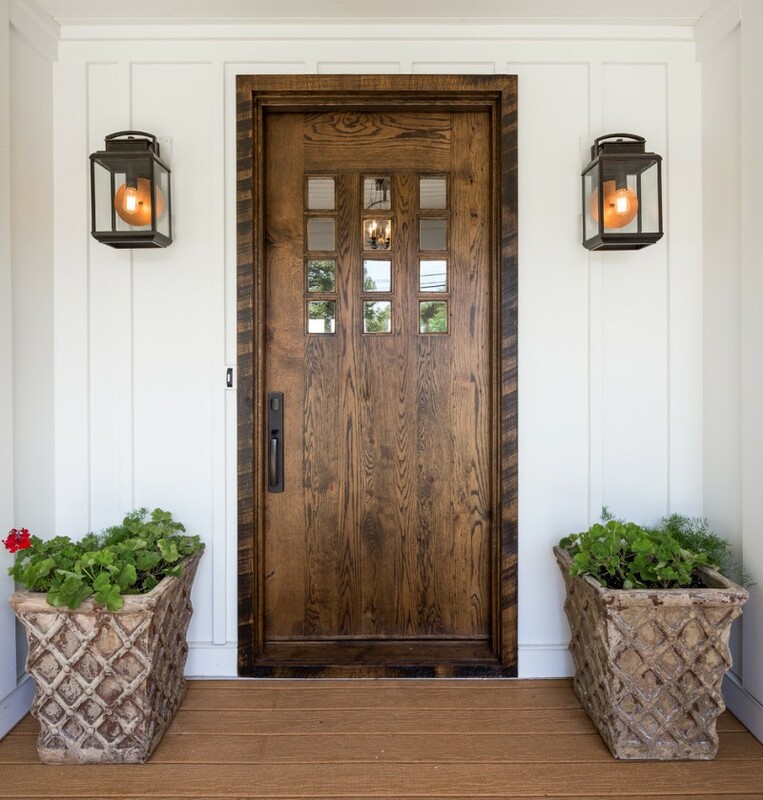 This is an example of craftsman exterior idea with dark wood colonial front door, an interesting combination of contemporary and rustic. It’s clearly presented in overall design of exterior, especially the door and windows. They’re clean lines without eliminating natural appeal. 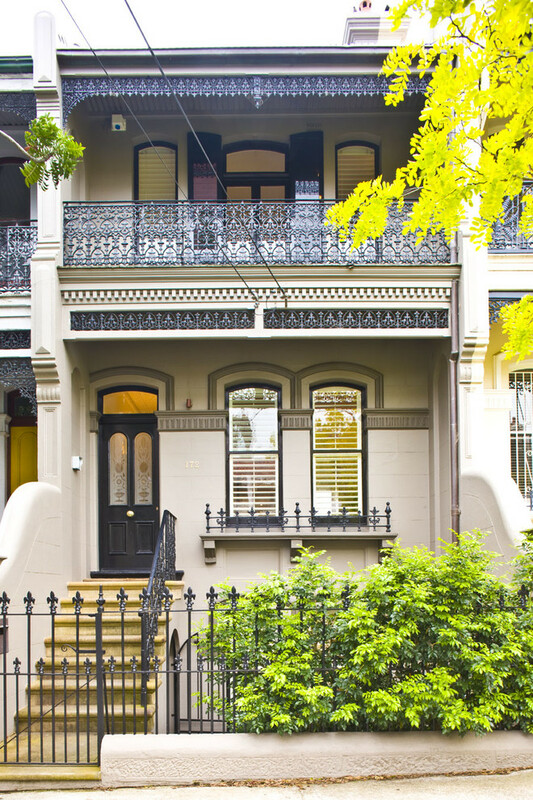 What amazing this colonial front door is! 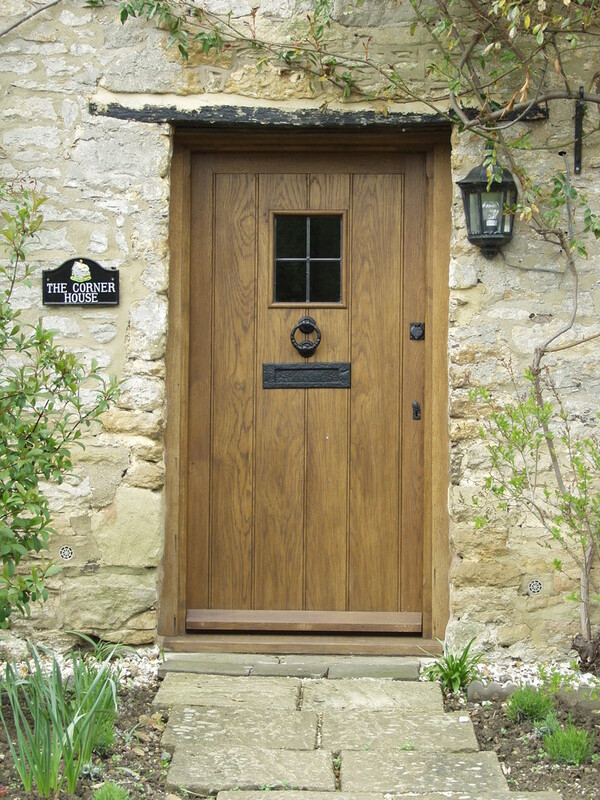 The wood door panel is designed as similar as the glass sidelights, and they’re framed by purely white trims. Grey shingles here become a nice background for both door and its sidelights. Traditional sconces add a dramatic & exotic look in this space. A contemporary exterior accented by contemporary and traditional elements. The door is designed in ultra big size and supported with custom hardware and mullions. Look at the transom and the sidelights, we don’t need the windows anymore due to their existence. 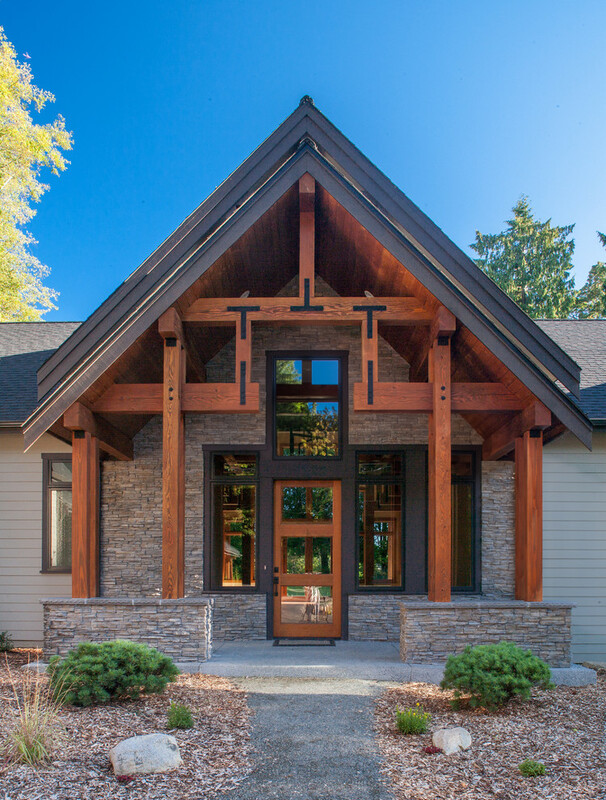 This is another craftsman exterior built from hardwood and stones. 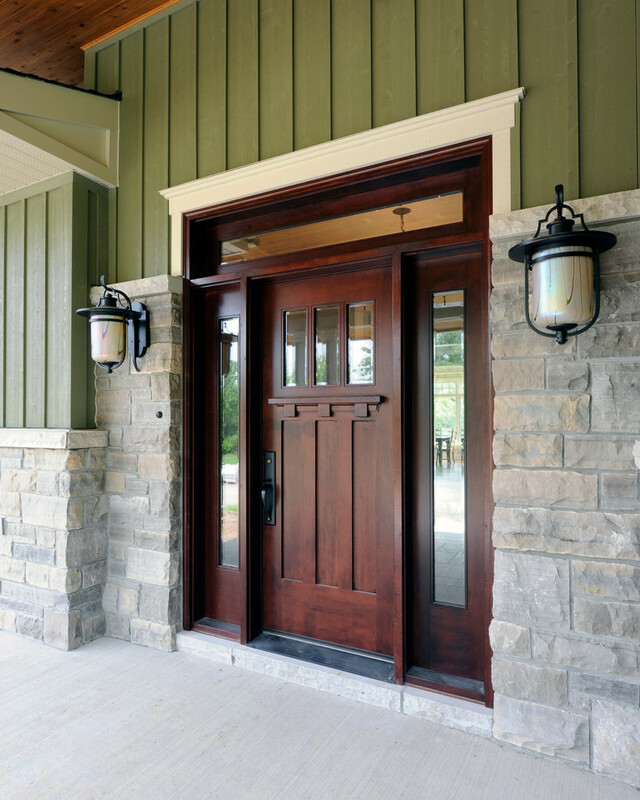 Just focus on the front door, it’s truly emphasizing the original raw wood specimen as the basic material of door. 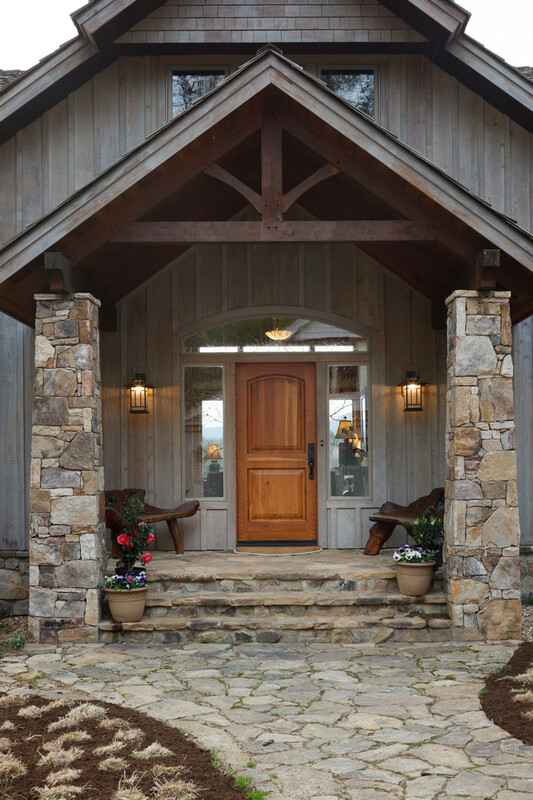 The exposed beams inserted on the sidelights become the focal points that also support raw rustic style. Mahogany colonial front door supported by hurricane and bevel glass sidelights. You may want to try this color combination for your exterior. Each color tone has different role in making the space stands out. It’s nice to get more security and aesthetic value on your colonial front door with such black wrought iron rails accented by handmade carving details. The reflective mirror panels make these rails look so obviously visible. The front door is modest, keeping the natural value existed and enjoyable. Different to other common sidelights, these sidelights are paneled by semi-blurred glass panels for a privacy. And, the door’s trims are in dark finishing, letting them bolder and older in look. 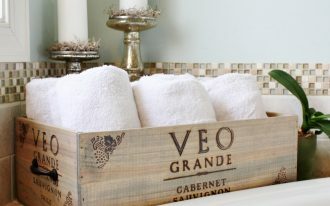 This is the simplest way to achieve antique yet elegant style. Solid, raw, hard-textured, and strong look. 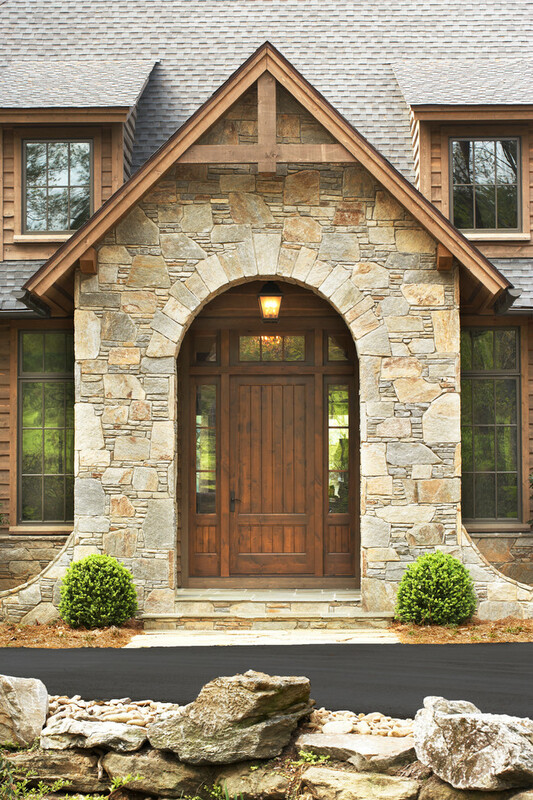 May be this rustic front door closely matches the stones exterior walls which also show rough texture & tone. 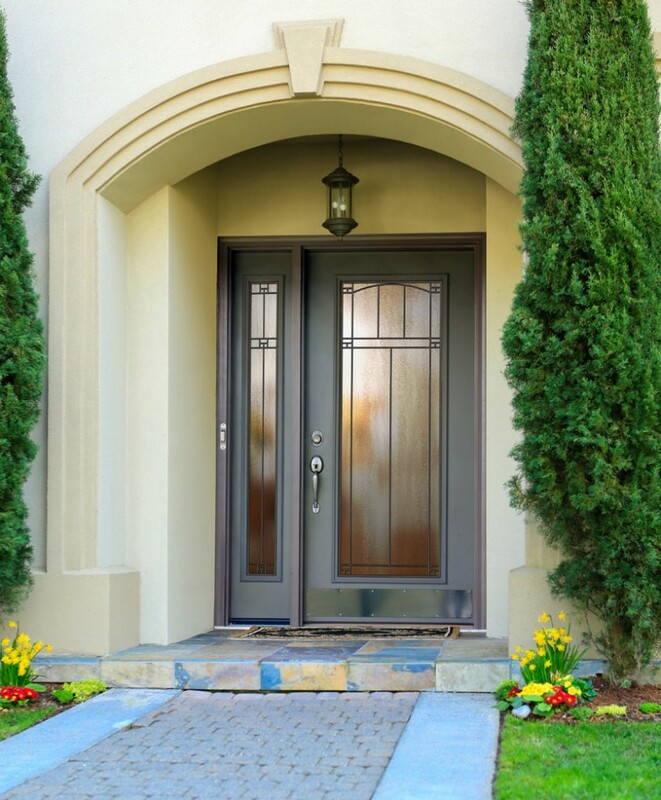 Lightweight steel is also well-recommended for a stylish front door. It’s inexpensive yet durable. It’s also easy to combine with any materials. 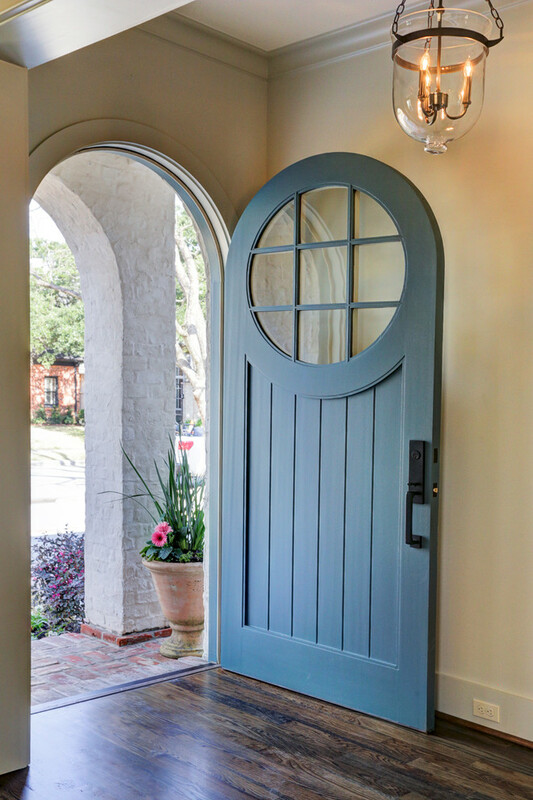 To make it more attractive, add some accessories as the accents like such tiny handmade-carving rails that decoratively frame the door’s glass panels. What a lovely front door! I love the contrast between the walls and door. Not only the windows, narrow glass panels inserted on the door are also stunning, providing the most attractive focal points in this space. 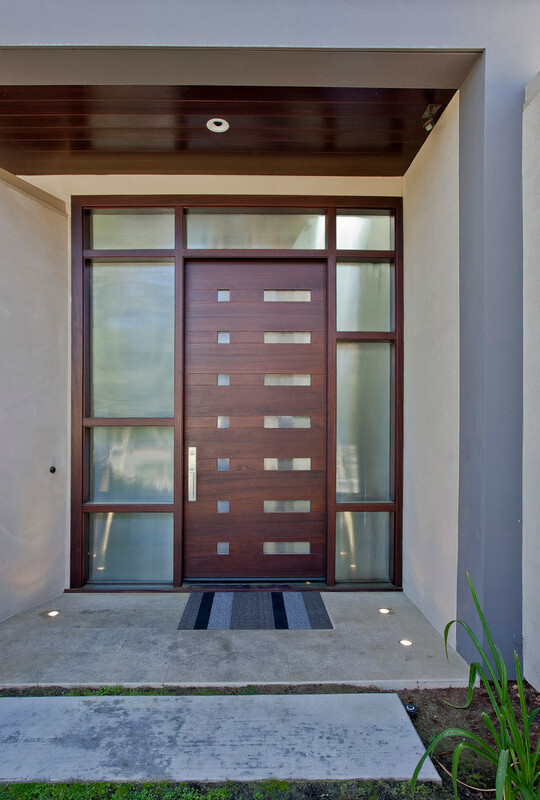 Clean line and modern look, the door is complemented by a simple but large sidelight. Black doff trims have perfectly framed both door and sidelight, offering a stylish mid century modern appeal. 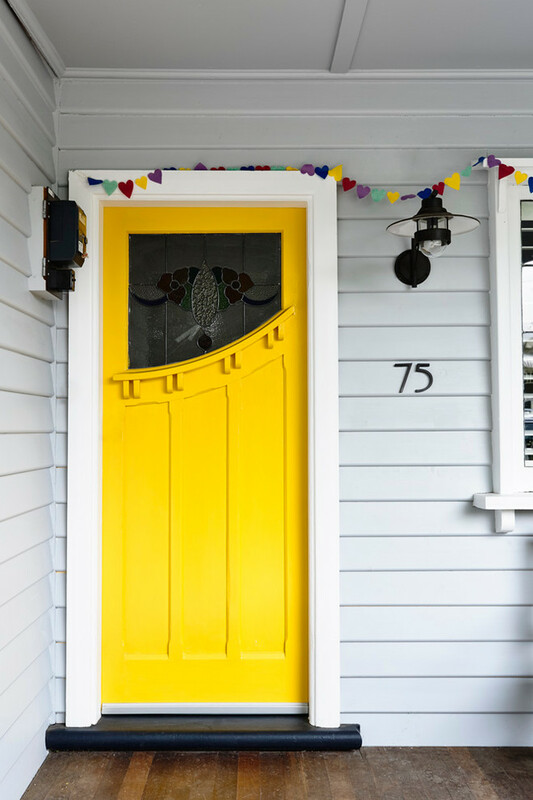 Use playful tone for pop up your exterior, particularly the front door. 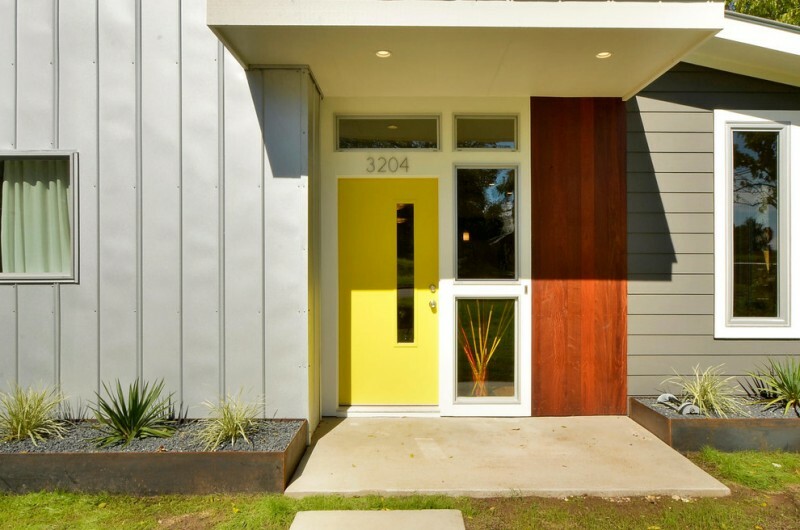 This mid century modern front door, for instance, is bravely stunned by bright yellow and accented by narrow glass panel. So interesting, right?